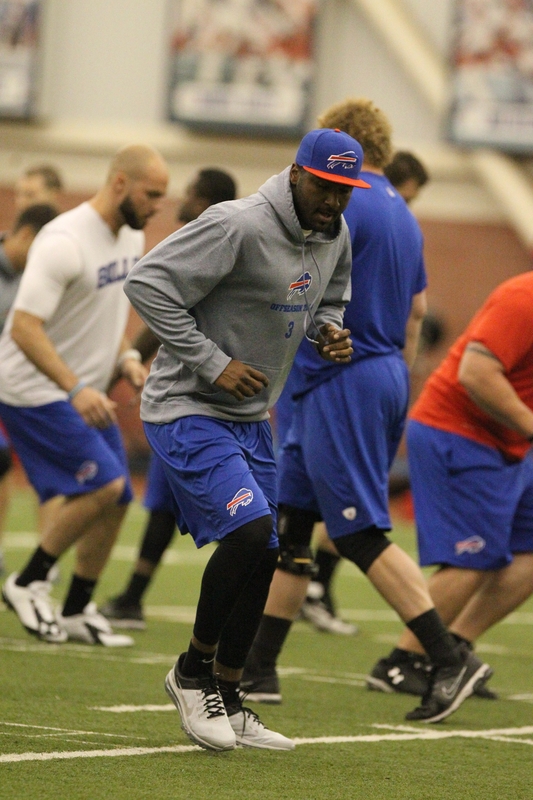 Bills quarterback EJ Manuel works on his footwork during Tuesday’s session in Orchard Park. That has been EJ Manuel’s approach to the start of his second year as quarterback of the Buffalo Bills, he said Tuesday. Manuel conducted his own on-field workouts with a handful of teammates over a five-day period late last month in Los Angeles. Joining him were Bills C.J. Spiller, Tony Moeaki, Chris Gragg and Brandon Kaufman. Then a couple weeks ago, he spent four days in Miami throwing passes on the field with Stevie Johnson, Kevin Elliott and Kaufman. Former NFLer Chad Ochocinco joined one day, as well. Before the L.A. practices, Manuel spent time working with quarterback coaching consultant Steve Calhoun, who runs QB camps in California and has worked with NFLers Cam Newton and Jake Locker, among others. Manuel underwent minor knee surgery in January to clean up debris from the injury he suffered in December, which kept him out of the Bills’ last two games of the season. He said the operation took a mere 20 minutes and he is fully healed from it. Manuel said he has looked at video of every one of his plays from last season. The Bills were 4-6 in games he started. He threw 11 touchdown passes and nine interceptions. Manuel thinks having a full offseason of work will speed his development.